Imagine what is must have been like to walk the streets of a big city like Chicago during the Roaring Twenties with Prohibition still in full swing. In those days, it seemed all the criminals had nicknames like Baby-face, Bugsy and Machine Gun to go along with their deadly comic book-like antics. People still dressed up to go to dinner, Jazz music was in full bloom over the air waves and secret passwords had to be uttered through a back-alley door to gain entrance to the local speak easy. Crime reigned supreme to the signature rhythmic typewriter sounds of what would become a hallmark of the times, the Thompson machine gun echoing in the streets. No firearm was ever a truer icon of an era more than the Thompson. Beloved by gangster and G-man alike, this firearm shaped a nation in turmoil before heading to war to help save the world. This week, we look at the modern civilian-legal Thompson 1927-A1 from Auto Ordnance to find out more about its legendary roots and why it is still popular today. Invented in 1918 by John T. Thompson, the rifle was created under the Auto Ordnance Company banner as the M1921. This new rifle was originally meant to be the answer to the trench warfare of World War I. Operating in the tight confines of hundreds of miles of trenches, the U.S. Army needed a more compact rifle with a higher volume of fire. The goal was to replace the aging bolt rifles of the U.S. military service and more effectively combat the German machine pistols. Unlike the large rifle caliber chamberings of existing battle rifles incorporating complex gas systems, the M1921 was designed as a pistol caliber submachine gun. Chambered in .45 ACP, Thompson’s gun would operate from an open bolt with a friction-delayed blowback action based off a patented Blish locking system. This new submachine gun could sustain rates of fire from 600 – 725 rounds per minute in a potential wall of lead heading down range to the enemy. Unfortunately for Thompson and his wonderful invention, the war ended before the M1921 could make its mark. With this turn of events, attention was turned to civilian and law enforcement sales in the U.S. The M1921 was literally a battle weapon looking for a war to fight. In 1938, the “Tommy Gun” got the call to duty by the U.S. military to serve throughout WWII and continue to remain in service until 1971. Through those years, there were slight design changes such as a straight forearm rather than vertical foregrip and the primary use of only the 20 round stick mags. Later versions would see the rifle reconfigured to no longer chamber the drum magazines as well as have the top charging handle relocated to the left side. This version would become known as the M1A1. Due to federal regulations, civilians were unable to purchase full-auto versions by 1936 and only semi-auto rifles were allowed. While at first glance the new semi-automatic rifles appeared to look the same, the internals were almost completely reversed by running in a closed bolt configuration minus the selector switch. This new production model was then listed as the model 1927-A1. 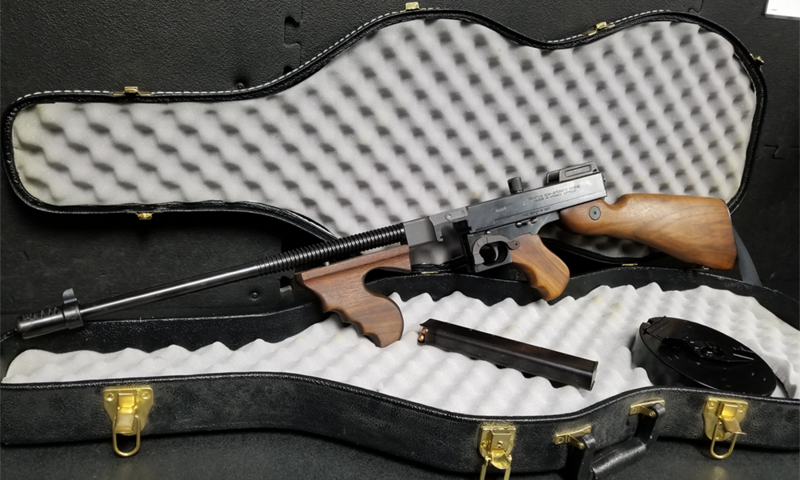 The only replica version of the Thompson, originally produced by Auto Ordnance of West Hurley, NY for the civilian collector’s market were made from 1974 to 1999. Since then, Kahr Arms has taken over the Auto Ordnance name to produce their own 1927-A1 under the original name at their Worcester, Massachusetts facility. Under Kahr Arms production, this rifle is known as the Thompson Semi-Automatic Carbine, Model 1927-A1. After an initial period of feeling each other out across the dinner table, the topic of firearms came up and I was invited by my girlfriend’s father, Art Marra and her brother, Joe to join them at the gun range. As the three of us made our way through the back roads surrounding the Pittsburgh area and I wondered if there was a rolled-up carpet and a long drop off a bridge in my future, we came upon their private range club. 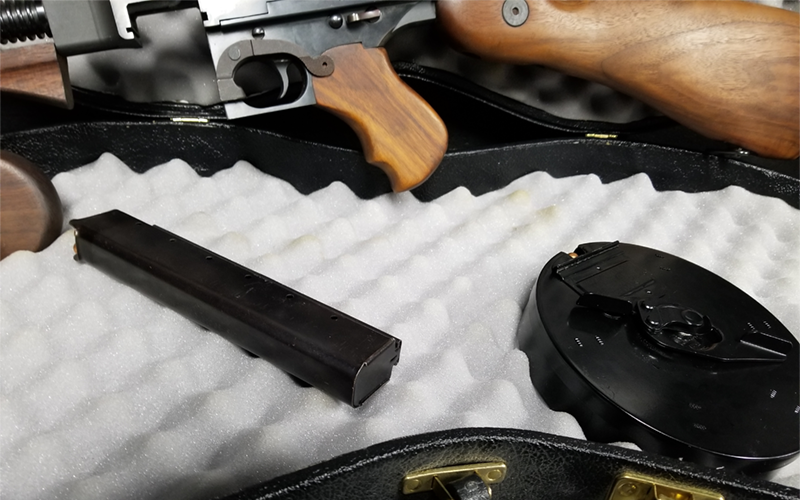 As Joe began to load up his pistol to start the shooting session off, Art reached in the back of his Chevy Blaser and pulled out a Thompson 1927-A1 along with a 50 round drum magazine. Outside of mobster movies, I had never seen one in person until then. Either this was the end in which I was about to be fitted for a carpet roll or we were about to seriously have some fun. Luckily, all rounds blazed down range that day and I got my first hands on experience with a Thompson semi-auto rifle. The first thing I noticed was how heavy it was. At almost 15 lbs. before loading, the all wood and steel construction harkened back to the days when guns were just as much art as functional tools of battle. Although due to BATF regulations, the 1927A1 version lacked the true classic 10” barrel, it was equipped with a good looking finned 16.5” barrel fitted with a historically correct Cutts compensator which adorned the submachine guns of the past. The forward and rear pistol grips were high polished walnut and felt very smooth in my hands. The stock had a unique drop at the cheek, one I had never felt with other rifles before like sniper rifles and the M4. 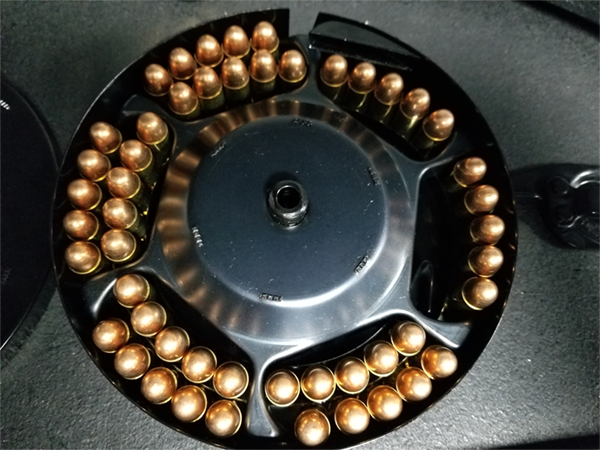 Locking the full 50 round magazine into place was like adding a brick to the overall weight. 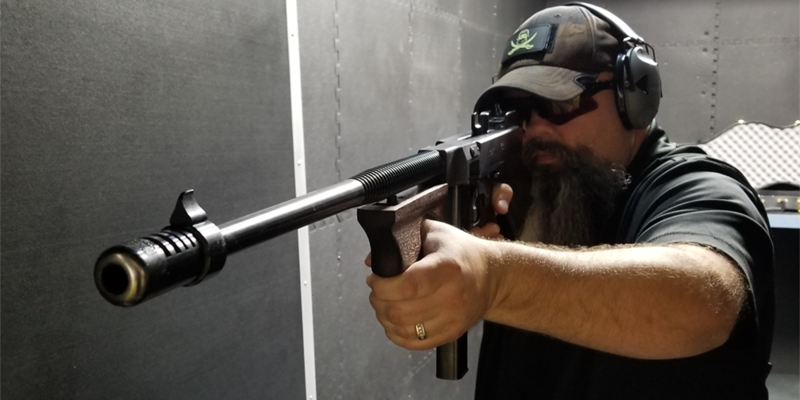 As I racked the charging handle and squeezed off the first few shots, I was amazed at how light the recoil felt was as the stubby 230 grain full metal jacketed rounds flew down range. As I worked my way through the drum magazine, I began to be more comfortable with the rifle. My shots sped up a bit while still holding steady on target as the Cutts compensator did its job reducing muzzle rise. Single shots bled into rapid fire and the signature RATATATAT report started to piece together to sound just like it did in the movies. Visions of wing tips shoes, model T Fords and gangsters started to cross my mind as I took turns running a small fortune in .45 ACP ammunition down range with my future in-laws. It turned out to be a great day for not only forging relationships but also placing the 1927-A1 on my wish list. When I was asked to review the Auto Ordnance Thompson 1927-A1, I was eager to get back on the range and give the new production model a try. I headed to On Target Sports in Orange Park, FL to enjoy a morning of intense range research and fun. Upon my arrival at the range, I was met by fellow Swanson Media Group writer, Clint Steele, who graciously volunteered to help. As we began to take turns firing the Thompson, Clint mentioned how much heavier it was than a traditional AR-15. Clint stated: “Its funny how much we don’t realize the AR spoils us until you pick up one of these (Thompson).” After a few magazines, the weight of the rifle turned out to have a big advantage in recoil management considering you are shooting a 230 grain 45 ACP round down range, not a tiny 55 grain 5.56mm. According to Clint, follow up shots were super easy, just hold in the middle of the target and keep pulling the trigger. The rifle’s U-shaped notch in the charging handle helps keep you on target despite drowning out focus from the much smaller and harder to see rear sight. Working from the stick magazine to the 50 round drum, the weight went from 12lbs to close to 17lbs. Other than an instance of not having the mag proper seated causing it to walk to the right and jam the bolt, the rifle ran flawlessly as it chewed a fist sized hole into our target at 10 yards. Once you get comfortable with the Thompson, it doesn’t take long at all to go through a lot of ammunition quickly. For the range session we used UMC, Remington and Blaser Brass 230 grain FMJ with no ammo-induced issues at all. I will say however, DO NOT think this is a weapon system as easy as the AR platform to manipulate. I have always thought of the Thompson 1927-A1 as a bit “steam-punk” in its levers, pins and action. The top charging handle is short and stubby, which when trying to lock back sometimes feels like it would be better performed with a third hand and a strong one at that. The charging handle is a bit heavy and the U-shape cut in the charging handle did cut into my hand once when clearing the drum mag jam. Overall, the Thompson 1927-A1 represents something larger than life. It is a symbol of an important era in our country’s history. For true gun enthusiasts, shooting this rifle is often a bucket list item. There are few firearms that offer quite the experience that shooting a Thompson will ever offer. Feeling the recoil pulse through the rifle as .45 ACP rounds fly down range and hearing that signature type writer sound will transport a shooter to yesteryear. As Clint mentioned after the range session, shooting a Thompson is a humbling experience to wield, and it really puts in perspective what our soldiers had to endure carrying it across Europe, bone tired and freezing cold. Although its big, bulky, and outdated, the underlying fact is the Thompson is simply fun to shoot! The lack of recoil and addition of drum mags that will fuel any shooters need for a good ammo dump. The drum magazine really adds to the “cool” factor but Clint and I both agreed it was definitely a no-brainer for the military to change over to the stick magazines for their troops. For the 20’s era gangsters, this gun was the perfect rifle to keep in the back seat of the getaway car and not have to carry far with drum mags fully loaded. A few years ago, I was fortunate enough to add a near mint 1927-A1 to my personal collection. Of all the firearms I have owned, I can honestly say the Thompson is the one gun I would never consider selling. If I were asked to put together a list of the top five “must own” firearms, the Thompson would certainly make the list. I’ve also invested in a special guitar-shaped carrying case and an authentic replica of the old school FBI case. These are a must of the true Thompson fan. The current production 1927-A1 from Kahr Arms Auto-Ordnance is a solid recreation of the original civilian design. Like the originals, the current 1927-A1 firearms are well built and offer the same experience as the originals. At first glance, even true Thompson enthusiasts are hard pressed to differentiate between new and old production without reading the engraved frame. Not to rest on its laurels, the modern Auto-Ordnance company has managed to take the design to the next level with several different versions. In addition to the classic blued finish, the rifle is currently offered in a matte black and even a gold tone with matching mags. 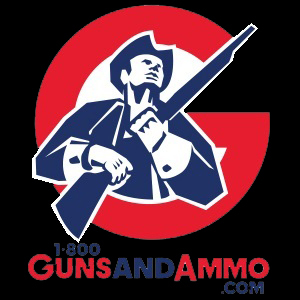 Full size rifles with detachable stocks, traditional Short Barrel Rifles (SBR) and pistol configurations are all currently available along with the company’s reproductions of the classic 1911, M1 carbines and more. 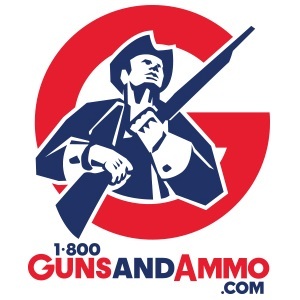 With local gun ranges filled with the “AR” flavor of the week surrounded by everyone’s favorite polymer pistols, you can rest assure that being the one cutting loose on the “Tommy Gun” will make you unique and different. Until next week, remember, if it’s good enough for “Big Poppa” Art Marra, its good enough for you and me!